The relief I felt was all consuming. I couldn't believe I had finally found it! This letter had been lost for years and I wondered if maybe it had been stolen. The letter was written by my distant cousin while he was fighting in the American Civil War at Ship Point, York County, Virginia in 1861. He died later in the Battle of Gettysburg in 1863, and this letter is a very treasured family heirloom. I carefully placed the letter in my safe. I won't take the chance of losing it again! To read all the wonderful stories, click HERE. This story is partially true. I do have a letter written by my distant cousin while he was in battle during the American Civil war in 1861. He was stationed in battle at Ship Point, York County, Virginia. He was killed in the Battle of Gettysburg in 1863. The letter is a treasured family heirloom. Great take on the prompt. I’m enjoying everyone’s posts this week a lot. Such interesting takes and historical and anthropological themes. A letter from the civil war would indeed be a treasure. Glad your character found it! Thank you Mandi! I haven’t had a chance to read any yet, but I will soon. It is wonderful! I treasure this letter. It probably isn’t worth anything other than being a family heirloom. It is very important to me. I want to find someone that can do something to keep it from aging. Yes, value to the family is priceless. Thanks for the tip! I will look for someone who restores books. Colleges may have an idea for qualified people in the area. Thanks Mark! That is an excellent idea! “That is a wonderful treasure you have there,” she commented. “It’s priceless to you, but going by Antiques Roadshow, it’s amazing how much somethings are appraised/sold at!,” she mentioned. “It made for a great response to the prompt,” she added. Thank you so much! It is priceless to me, I wouldn’t want to sell it. Thank you Sonya! It is very special to me. Wonderful story. 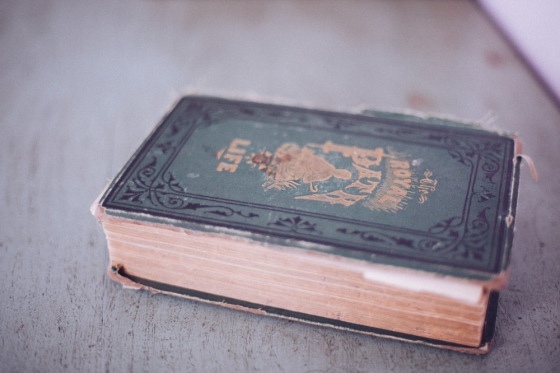 It’s amazing how you created such a nice story out of that battered book! Thank you so much Jahnavi!! 🙂 I appreciate your comment. Wow! Now that I read your post script that the story is true, I can understand how significant that letter has been to your family. It sure needs to be treasured. Thank you! It does need to be restored and hopefully something done to keep it from aging. I love OLD letters! I imagine the person writing it in the world as it was then. Just wow. Yes, I know!! He wrote it from the battlefield and in the letter described things going on around him and also what they had to eat (mostly fish and sweet potatoes). He said they would trade some of their food for bacon. They had a hard life on the battlefields. He was telling his mother that he had a bad case bilious fever (whatever that is). And asked her to send him blankets and writing paper. Very interesting! Wow! We have one from the 1800s Ireland….talking about how bad it is over there. And numerous love letters of my Grandfather to my Grandmother. Can you image the scene of him in the conditions he wrote that letter that you have? And the hands that touched it over and over again???? That is wonderful that you have some letters from Ireland talking about the conditions there. What a treasure! This young man talks about what it is like where he is and how they have to burn pine branches to keep the mosquitos away. About all they have to eat is fish and sweet potatoes and sometimes could trade their fish for bacon. He even asked his mother to mail him some butter if it wasn’t too much trouble. Amazing!! I can imagine all the hands that handled that letter! And I can imagine how cherished that letter was. I think this is fabulous. It paints the real world of that time for us. Fish and sweet potatoes. Likely something to get very tired of quickly. But I’m glad they had that much. Yes, It sounds like they didn’t have a lot to eat except that. He said they would trade some of their fish for bacon occasionally. I bet that bacon sure tasted good to them! Yes! It was probably even better way back then too! I forgot to mention how wonderful it would be to have love letters that was written between your grandmother and grandfather! What a treasure! Oh yes! Absolutely! That would be divine!! That certainly is a treasure. My mother has worked tirelessly on our family history and so little tangible evidence exists from our ancestors. A letter like that is priceless. How wonderful that you have it. Great story, PJ. Thank you! It is wonderful to have this. I also did a lot of genealogy. Having something like that makes you want to know more. I know that my cousin that was in the Civil War died at Gettysburg in 1863 and he had a sister and a brother who also died in 1863. I have not been able to find what caused their death. History has always fascinated me, but to tie oneself to events like Gettysburg has to be exciting. I always tried to explain to my kids that history isn’t a bunch of names and dates in a book. It was real life for real people. Eh, they never really got it…lol. When I was in grammar school, history did seem to be only a bunch of names and dates. When I got older those names and dates became more significant. Family history makes it even more real and significant. Great story! The family history made it so interesting. That felt real because of many times I would search for something and conclude that it’s been stolen, until I see it stuck somewhere 😄😄 Good take on it. LOL! I do the same thing. Thank you for your kind comment. That is such a wonderful and treasured letter and it is great that it is in the hands of someone in the family that really cares about it. Some people may have just thrown it out like it was nothing. It will be a wonderful thing to pass on to other generations in your family. Your story is very special, Joy and I enjoyed reading it. Thank you so much, Jessie! I treasure this letter. It’s a family heirloom. Great story, PJ! And with the truth behind it, makes it extra special! Awww darn it. I’m sorry you are having to go back to work tomorrow. Hopefully, this is the last weekend you have to work. Sure is going to make it a loooong week! You are probably in bed now. I have been watching Discovery ID. Pretty good serial murder show is on for the last 4 hours. Sweet dreams! I hope your Windows 10 will download now! Who would know that your Norton virus ware needed to be updated first. I wouldn’t have known! Google is what I used to research my downloading problems. Oh, okay! I thought you were calling me Google. Hahaha! Did you get it downloaded? I hope you don’t have to stay at the office too long today because you could use some well deserved R&R. It’s 3/4’s done, but I’m wondering if it’s stuck now as the bar display doesn’t seem to be inching closer to being done…we’ll see if it’s done when I get back home. Oh dear, I hope it isn’t stuck again. I like this one, wouldn’t that be something to have a letter like that! Made me think. Did you read my footnote? I have a letter like that. It was written by my distant cousin. I have my grandfather’s scribbled little diary from his time oversea as a soldier in the first world war, so I fully appreciate how important and precious these glimpses of our ancestor’s past are. Keith, that is wonderful! That would be a wonderful thing to have. Of course, I did not know this young man. I only know through genealogy he is a distant cousin. I treasure this letter as I know how dearly you treasure your grandfather’s diary. I have to say Wow cause I am really bad at keeping or holding onto things, same with my mum so it’s amazing to see you’ve such a treasure for so long! Thank you Ameena! I try to find out all I can about this person. Little by little I am getting more information about him and his family. He died in the Civil War, the first day of the battle of Gettysburg in 1863. He had a sister and a brother that also died that same year. So tragic! Oh my, that’s tragic. It’s wonderful of you PJ, trying to found out more about a relative separated by almost a century. Memories and memorabilias are a Treasure. Thank you Ameena, He wrote the letter in 1861, 145 years ago. He died in 1863, on the first day of the Gettysburg battle. (It lasted 3 days and had the most casualties of any of the battles of the Civil War). It is very endearing to have something like that from one of your distant relatives. Yes, it really is! It is a family treasure. The story is great, but what makes it even better is that it is based on truth. Funny, I just came across a newspaper from June 6, 1944 in my grandfather’s belongings. D-Day. It’s yellowed and dried out and I want to get it preserved somehow, too. If you find someone, please let me know and I will do the same for you. Thanks. Thanks Emilio! I sure will let you know when I find someone to preserve the letter for me. That’s wonderful that you found this old paper from D day! Amazing! PJ, on a side note. There was a writing challenge last week that had 3 sentences you had to use. One of them was “Almost everything I’m going to tell you is true”. Do you know who’s challenge that might have been? Sonya, with “Only 100 Words” has a weekly 3 Line Tale Challenge. It might have been written for her challenge. Thanks. I just looked but it wasn’t her. They gave you 3 lines that you were then supposed to use in a story. Oh, well! I’ll keep my eyes out. If I see someone else that has one of these types of challenges, I will let you know. I’m asking a lot of different people about this challenge so maybe soon I can get the answer for you. Thanks, It’s driving me crazy because I thought it was something I would enjoy but can’t find it again! I have asked about 10 different people and they all direct me to Sonya’s challenge. It sounds like it would be a fun challenge! I will keep my ears and eyes open and let you know if I find out. What a coincidence! I just posted about my grandad’s journal! I love the treasure reference and feel you on it! Thank you OM. It is very special to me as I am sure your grandfather’s journal is to you. Indeed they are, Maria! Priceless! I second Maria’s thoughts here. Your story reminds me of a movie named Glory. If I’m not wrongg then it was about the battle of Gettysburg. I would love to see that movie! Wonderful story, and how wonderful to have that piece of your family history. I know very little about my family history and any letters would be in Italian and I wouldn’t understand it. It is wonderful to have this little piece of history. If you had anything and it was in Italian, you could have it translated. Oh, also, thank you for the kind comment! Fascinating! Specially the fact that you actually do own such a letter. Thank you so much! Thank you for your kind comment. Those priceless ‘heirlooms’ are so precious to our heritage. Well told! Thank you so much, Roger!